What a statement a bit of color can make! Our Lime Green 3/4 Sleeve Basic Chef Jacket adds instant polish to a front of the house look as well as clever functionality to your back of the house work force. This coat is manufactured in 65/35 poly/cotton Light Weight fine twill fabric. 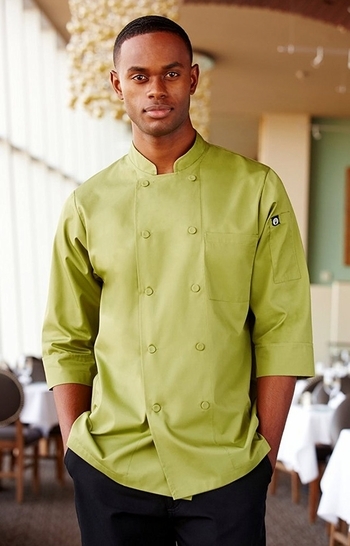 Its rich color and easy care fabric will keep you looking sharp even after the longest kitchen shifts. It features 10 cloth covered buttons, and double breasted styling. It's finished with a left chest patch pocket and the ever essential thermometer pocket on the left sleeve. 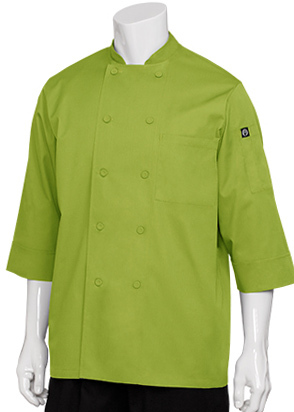 The Lime Green 3/4 Sleeve Lightweight Basic Chef Coat is available in sizes XS-3XL. (Up Size Charges apply, for size XL please add $1, size 2XL add $2, size 3XL add $3). 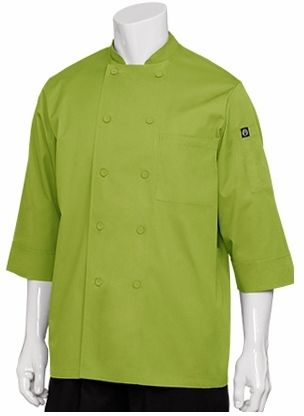 This product is manufactured by Chef Works, an industry leader in restaurant uniforms and apparel.